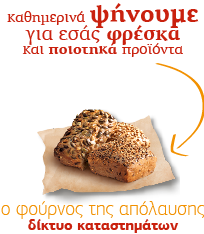 APOLLONION SA, is a leading Greek company in the production of dough and confectionery active in development homonymous chain stores, known to all as "APOLLONION Bakery ". 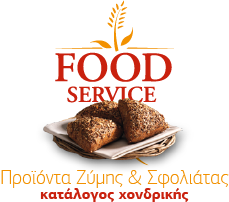 Aiming to offer everyday tasty treat to the consumer APOLLONION SA retains 23 stores located throughout greater Athens area and constantly develops. Meanwhile, APOLLONION engaged in wholesale or "FOOD SERVICE", supplying its products to a wide range of businesses such as restaurants, hotels, cafés, airlines, hospitals canteens, universities, factories, schools, enterprises, etc. 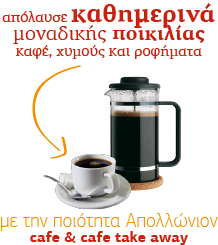 With a unique production and operation concept in Greece using only branded, and a certified quality raw materials, by the best firms in Greece and Europe, APOLLONION offers the Greek consumer fresh, healthy and tasty products to a huge variety, able to meet every dietary and cover any need.